We have all rights to say that this years 5K-9 Working-Dogs AVD e.V. UK event was a complete success and can be called a mega event. We set records in a variety of sectors. but because of the strong interest and large number of entrants it didn’t come up. and the social part could not start before sundown. Of course the offered training was done afterwards. our events from time to time knows that it is not out of the ordinary that our night trials were finished at dawn. But this marathon night trial will be remembered as the one ending up at teatime on sunday. zwp attendants. From finished night trial and the award ceremony the decoys went directly to the surprise attack and courage test of zwps. Luckily we decided not to train afterwards that some of us got the last train back to mainland. The years before we had a few more spectators, but on the other hand we broke some records of number of participants since the foundation of the AVD e.V..
We have to thank all participants, all spectators and of course whole AVD e.V. crew from UK and Germany. We’re looking forward to our next event on August the 19th/20th in Essen, Germany. And we ‘re also looking forward to meet you in 2017, maybe with another additional day. 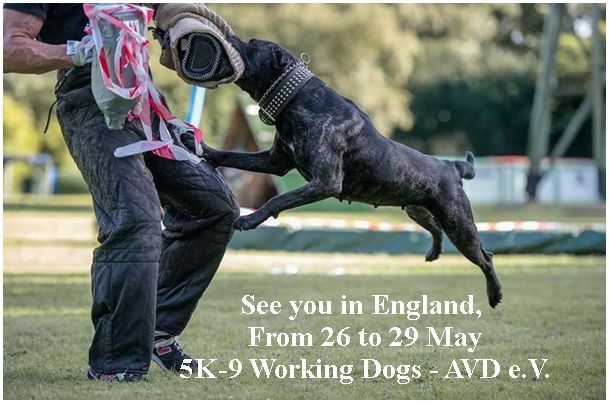 Das diesjährige AVD-England-Treffen kann mit Fug und Recht wieder als wahres Mega-Event tituliert werden. Wir haben gleich in mehren Bereichen Rekordzahlen erzielt. Freitag wollten wir zum Warmup Training auch schon die Möglichkeit für ZWP’s einräumen, was extrem zahlreich genutzt wurde. Am Samstag standen Daytime Wettkämpfe und eine spektakuläre Nachtübung auf den Plan. Am letzten Tag es Events, am Sonntag, sollte dann neben ZWP’s noch freies Training angeboten werden. Obedience, Best Long Send, Best Ringsport-Attack) und der Nachtübung (Puppy, Bronze, Silver, Gold) so viele Starter, dass die Nachtübung nicht nur, wie häufig, in den frühen Morgenstunden endete sondern erst um ca.14:00 am nächsten Tag. Und diese Marathon-Nachtübung war dann am Sonntag noch nicht einmal das wohlverdiente Ende dieser 3 Eventtage, da einige noch die angekündigte Chance nutzten und weitere Hunde zu den ZWP’s vorstellten. Auf das freie Abschlusstraining wurde dann gottlob, einstimmig verzichtet. Nach diesen drei mit Hundesport vollgestopften, schlaflosen Tagen waren alle Figuranten, Aufbauhelfer und Organisatoren auch wirklich mit ihren Kräften am Ende.